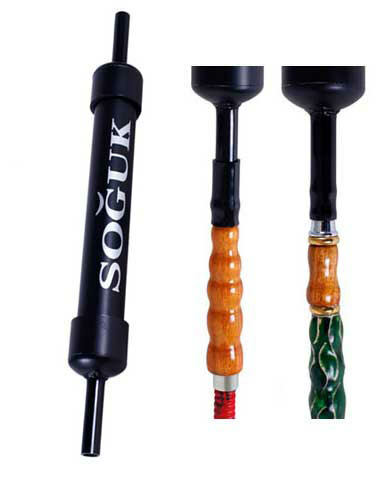 Introducing our newest Hookah Smoking Accessory, the Soguk Cooling Hookah Hose Attachment! This new hookah accessory is made in the USA and will fit with almost any hookah hose. The Soguk utilizes an internal coil filled with a vegetable based glycerin solution that stays frozen longer than water to provide enough cooling power to last through the longest of hookah smoking sessions. To use the Soguk, simply place the unit into the freezer for 3-5 hours. When you remove the Soguk from the freezer wipe away any excess condensation or frost and then press the rubber tip over the end of your hookah hose. The Soguk will be very cold to the touch when it is first removed from the freezer but the heat from your hand will warm the outer layer of the Soguk to a comfortable temperature. The Soguk will fit over metal tipped mouthpieces with ease and there is an included adapter for use with wood tipped hoses. If you are planning to use the Soguk with a hose that features a removable mouth tip such as some KM hoses or all Nammor hoses, you will need to use an Egyptian Hookah Head Gasket to make a perfect seal. Soguk Cooling Hookah Hose Attachment has a average rating of 4.5 stars out of 5 stars based on 2 reviews.